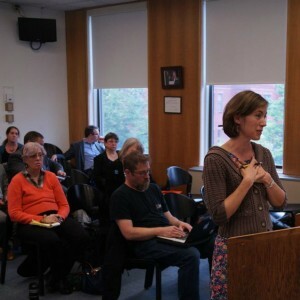 NORTHAMPTON – “I’m here because we value young people and their development,” said Heather Warner, speaking to members of the Massachusetts Alcohol Task Force at Northampton City Hall on Tuesday. Warner, a member of the Strategic Planning Initiatives for Families and Youth (or “SPIFFY”) was one of a large number of public safety and youth health advocates to attend the Task Force’s meeting–one of six scheduled to be held throughout the state between now and June 13th. The Task Force, whose creation was announced in January by state Treasurer Deb Goldberg, is tasked with gathering input from state residents, community leaders, and business owners as officials mull a potential overhaul and “modernization” of Massachusetts liquor laws. A potentially large-scale shake up of state laws, the prospect of re-writing the rules around liquor and drinking has spurred a convergence of interests and concerns from various sectors of society. Advocates like Warner are pushing for tighter, more conscientious controls on youth drinking even as the state considers opening up its markets to allow liquor to flow more freely at businesses. “We feel really strongly that public health needs to be at the table,” said Warner Tuesday, citing figures about the state costs of substance abuse, drunken driving, and youth binge drinking.